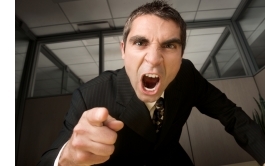 What Do You Do When Your Top Salesperson Is Also An Internal Nightmare? Clients love Michael and your company loves his revenue production. Ever since he joined the company three years ago, he has been the rock star. He is head and shoulders above the rest of the sales team. While clients love him and the company loves his revenue, inside the company – he is despised. He is rude to customer service and finance people. He is nasty to implementation people. During exit interviews, people have mentioned Michael as a reason they are leaving the company. He’s even disrespectful to you … his sales manager. If he was a bottom or even a mid-level performer, you would have kicked him to the curb years ago. Since Michael brings in 40% of the company’s revenue, the decision is not that easy. And, the heads of the customer service, finance and implementation are screaming at you to do something and fast! What do you do with Michael?